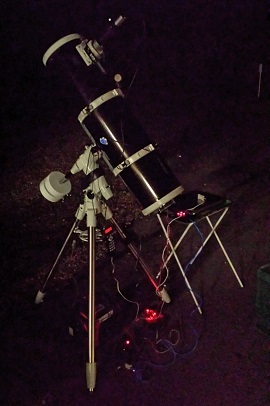 The start of the month has been really overcast and misty, I've been watching the Astro Panel app on my phone like a hawk hoping to have a clear night and it eventually arived on the 10th there would be anohter on the 12th which i would be away for and i wouldn't be able to take my scope, and to rub salt in the wound my friend Jim Vincent captured a great image of the 'North America Nebula' (NGC 7000) on the 12th (FB - Dengie Garden Astronomy). The first clear night of the month was the 10th so i got my scope out and as Comet C/2014 E2 Jacques was still visable i thought I'd give it a go. It took me a little while to polar align my scope and after a 3 star alignment the scope still seemed to be out of alignment. I had previously updated Stellarium with Comet C/2014 E2 Jacques data and i tried to find it but with no joy! i then thought I'd try and capture chunks of sky where Jacques should be and compare images but i couldn't get my QHY5L-II Guide/Planetary camera to work with SharpCap2 even though i am using the recommended WDM drivers. I then thought I'd try my EOS but before I did i would do a few more alignments and tried to use the polar alignment option on the SynScan Mount but i just seem to be going round in circles! Eventually at about 22:30 i gave up and packed away, i really need to get better at aligning as i have now lost a few nights due to bad alignment! After my last observing/imaging session i had the feeling my scope wasn't fully collimated and thus not giving me the best images it could. I had previousy made myself a collimation cap from a spare lens cap i had as detailed in the mod. Step 1: Center the secondary mirror on the axis of the focuser drawtube. Step 2: Aim the eyepiece at the center of the primary mirror. I followed the steps detailed in my SkyWatcher Manual but there are many how-to and videos on the internet. I plan to buy a laser Collimator later this month so no doubt i'll touch on this subject again. 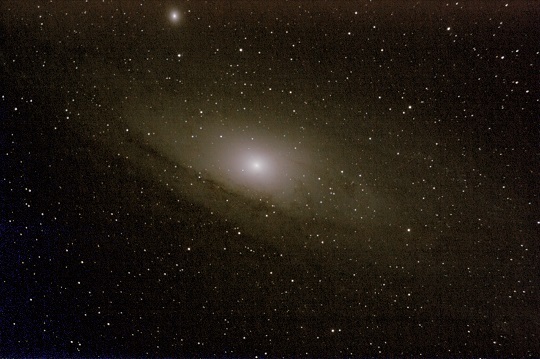 From the 10th to the 23th there has been cloud cover and haze day and night so no stargazing but the 24th was the first clear night so i planned to have another pop at Andromeda. I got set up and unlike the 10th i managed to polar align fairly quickly and accurately and then some light cloud rolled over! I checked Astro Panel and it assured me that the skies would be clear from 21:30 so i left mount and went inside for my tea and made my self comfy on the sofa. I checked the sky a couple of times and the cloud was clearing as I'd hoped and by 22:00 it was really clear. I grabbed my scope and started a 3 star alignment, this time i thought I'd enhance it by putting my SPC900NC webcam in the eyepiece and using SharpCap2 and a reticule overlay to get better alignment. I actually did a second alignment just to be sure and it was fairly spot on. I have done a little reading since last time i imaged deep sky objects and taking Darks, Flats and Light images for stacking in DeepSkyStacker seems to be the way forward. The Light Frames are the images that contains the real information: images of galaxies, nebula... This is what you want to stack. Dark Frames The Dark Frames are used to remove the dark signal from the light frames With DSLRs and CCD Camera, the CMOS or CCD is generating a dark signal depending of the exposure time, temperature and ISO speed (DSLR only). To remove the dark signal from the light frames you use a dark frame that contains only the dark signal. The best way to create the dark frames is to shoot pictures in the dark (hence the name) by covering the lens. The dark frames must be created with the exposure time, temperature and ISO speed of the light frames (resp. flat frames). Since the temperature is important try to shoot dark frames at the end or during your imaging session. Take a few of them (between 10 and 20 is usually enough). DeepSkyStacker will combine them automatically to create and use a clean master dark or master dark flat. Flat Frames The Flat Frames are used to correct the vignetting and uneven field illumination created by dust or smudges in your optical train. 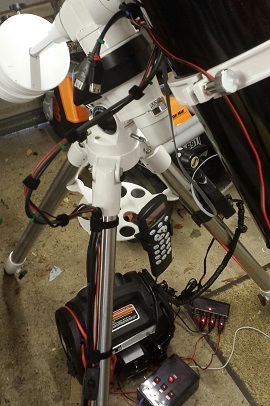 I setup my QHY5L-II and finder scope to create a guide scope and attached it to my scope. I then connected the EOS and got the laptop running all the required software. I slewed over to where Andromeda should be and relief it was there. I took some test shots to get focus - in hind sight i probably should have used a Bahtinov mask for better focus. I then popped the scope's cover back on the and took 15 Darks ready for processing in DeepSkyStacker (now after writing this blog i realise i should have taken them last). I then removed the cover and took 37 x 10 sec. images at ISO 800. The next job was to take the Flats. I slewed the scope over so it pointed at my garage door that is a just off white. I then secured a white T-Shirt over the front of the scope and then pointed two high powered LED torches at the door. I took 15 Flats for the processing (again after writing this blog i should have changed the exposure to auto). The next day i loaded all the Darks, Flats and Lights in to DeepSkyStacker and produced the flowing image. As you can see its quite faint, i know why though, my exposures were far to short at 10 seconds and the ISO should have been 1600 but we live and learn. 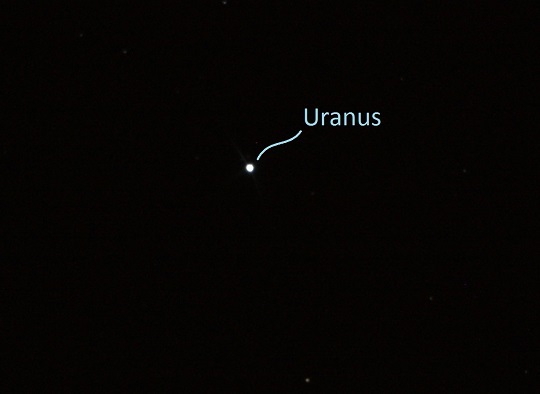 By the time I'd finished imaging Andromeda it was getting late and I'd noticed that in Stellarium Uranus was now visible over the houses to the south so i slewed the scope over to it and took the image below its a bit burnt out but its definitely Uranus! I was getting pretty fed up with all the cables that hang off my scope and as my wife was having a coffee morning one Friday i thought I'd get out the way and hide in the garage and do some cable management. As you can see below in the before and after images this should make my life a lot easier.